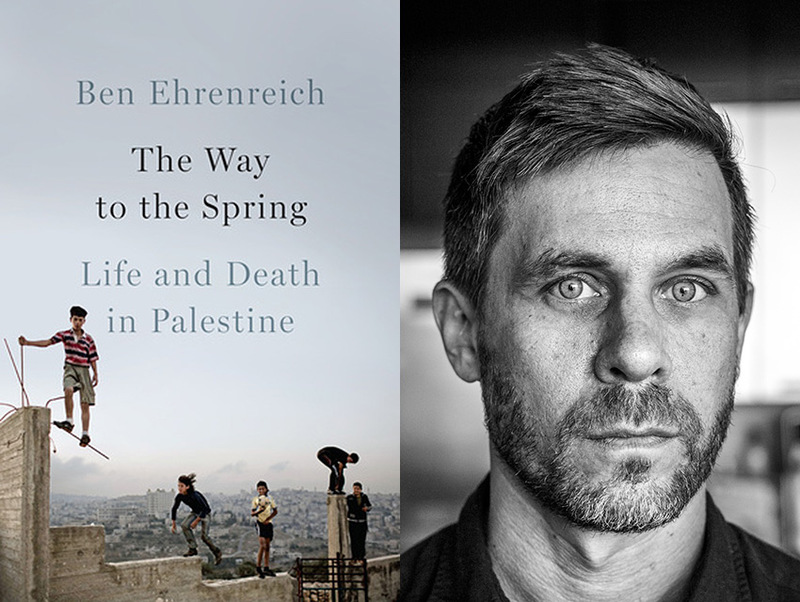 When Ben Ehrenreich started spending time in the West Bank in 2011—the award-winning writer even lived there between 2013 and 2014—he went, in part, on assignment for the New York Times Magazine and Harper’s. What he returned home with is The Way to the Spring: Life and Death in Palestine (June 14), a collection of revelatory anecdotes offering a pragmatic, somber look at the everyday issues Palestinians face. Pieced together, the stories tell a tale of a region’s resistance. Here Ehrenreich reflects on the the Israeli-Palestinian conflict’s place in American media and the ways he sees the area’s violence reflected at home in Los Angeles. The American media has been generally silent when it comes to reporting on the injustices in Palestine. Why do you think that is? You know, I think the issue of Israel is one of the touchiest for Americans. People have extremely strong feelings and simply don’t want to discuss it. On top of that, I think Israel has built up a very powerful political lobby. All of that said, though, I think has gotten a lot easier within these couple of years, and I think there’s been a real opening. And it’s more possible to talk about things that it wasn’t possible to talk about recently. Why do you think it has gotten easier? It’s a couple of things. I think there’s a generational divide—younger Americans and younger Jewish Americans don’t have the same kinds of ties to Israel and unquestioning loyalty to Israel that their parents’s generations had. But even more than that, the violence of the last few years has been so one-sided and so over the top that it’s very hard for people—Americans and Jews of all ages—to feel good about supporting Israel without being criticized over it. I’m talking about more than 2,000 dead in Gaza in the last assault in 2014, another 1,400 dead between December 2008 and January 2009, nearly a quarter of them children in both of those wars. In both of those, the vast majority of the causalities were civilians. I think the word is getting out about the less spectacular but still systematic injustices of the occupation in the West Bank, and people have a really hard time justifying it for themselves. You lived in Ramallah and other small villages in the West Bank. What was it like moving back to Los Angeles? How did your experience change your perspective of our city and this country? Living there and seeing stark forms of violence made it harder to not see subtler kinds of violence that are everywhere in Los Angeles. There’s the sharp violence of economic inequality, the displacement of people in terms of homelessness and gentrification. You can call it a lot of things, but the way it ends up working is like an ethnic cleansing of a lot of neighborhoods. We don’t always think of it that way, but it is violence when you have someone in a desperate situation right next to someone living comfortably. And of course, the omnipresent police violence. People are killed all the time in L.A. by police, by sheriffs. The policing used to maintain the barrier between the rich and the poor—all of that was harder to miss. I am more disturbed by what I saw in the U.S. and specifically L.A. [than what I saw in the West Bank]; there I saw violence all around me, but the thing that made it hard to bear here was that it didn’t seem like people saw it. What kind of parallels can you draw between the Israeli-Palestinian conflict and police brutality conflicts in the U.S.? The parallels are unfortunately unending. The LAPD has gone to Israel for training. There are a lot of direct connections like that. The first time I ever had rubber bullets shot at me was in Los Angeles—the police in the West Bank and the police here often use similar tactics. I think more than that, the thing that really connects them for me is the way people see one another—the ignorance of how people live just a few miles away. The divide helps perpetuate the inequality and the violence. You’ve written for multiple publications (ours included), have completed two novels, and previously taught writing at Otis. What’s one topic you’d like to tackle in the future? Every time I finish a project I tell myself the next thing I’m going to write about is puppies. Something cuddly or happy to make me laugh. But it never seems to work that way. I don’t know what my next project is going to be exactly, but it would probably have something to do with climate change, something that has become impossible to ignore in terms of our future. Then, after that, I’ll do the puppy book. I’m currently reading a novel called Death at Intervals, which is about Death deciding to no longer visit a certain country and what happens when people just stop dying. Another book I’m reading is The World Without Us by Alan Weisman, an amazing reported and researched book. It talks about what would happen to the planet if humans suddenly disappeared.